It’s no secret that I constantly write in Markdown, which is a brilliant solution for the problem of keeping files in readable, portable formats, but also allowing for useful structure and formatting. In a nutshell, Markdown lets you write plain text in a way that’s not only readable as-is, but can also be converted to HTML. If you’ve ever emphasised a phrase *like this*, you’ve used Markdown. If you’ve ever used a series of asterisks to create a makeshift horizontal separator, you’ve used Markdown. If you’ve ever made a list by starting each line with a hyphen or a number, you’ve used Markdown. It’s intuitive, it follows very common conventions, and it’s simple to learn and use. I write every article on this site (and my articles for publication elsewhere, in magazines and online) in Markdown. All my notes are in Markdown files. My weekly members-only letters and essays begin life as Markdown files. I even think in that format. Markdown is also concise, and isn’t well served by a lengthy guide. Accordingly, I’ve written a mini-ebook to help you get started. It’s ultra-focused, digital only, and can be read cover-to-cover in about twenty minutes. A quick, approachable, readily digestible briefing, so you can go from zero to informed within a lunch break or a brief commute. 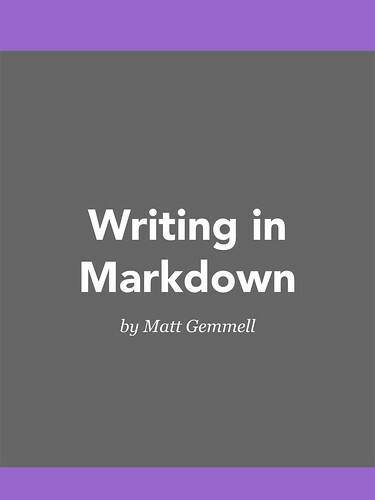 It’s called Writing in Markdown, it’s about 5,000 words long, and it’s available now. On the Kindle Store: On Amazon.com, or on Amazon.co.uk, or your local Amazon site. You can also buy directly from your Kindle by searching for Writing in Markdown. It’s only $2.99. On the iBooks store: You can buy the book here, or search for Writing in Markdown in iBooks on your Mac or iOS device. It’s only $2.99. As a bundle: If you prefer, you can get three formats at once (Kindle mobi, iBooks epub, and PDF) as a bundle. You can buy the bundle here. It’s only $3.50. All formats are DRM-free, even on the Kindle and iBooks stores. Even the book itself was written in Markdown, which seems entirely appropriate. I very much hope you’ll enjoy it. Note: The book was previously published by Five Simple Steps, who have since closed down. If you bought the book from Five Simple Steps, I’d be delighted to provide you with new versions of the book for free – just send me your original order confirmation email. You can find my contact details here.